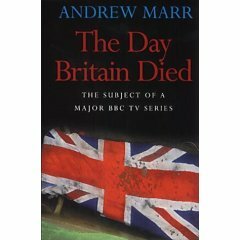 This study of the state of Britain in the immediate aftermath of devolution betrays its origins in an accompanying TV series. One can almost hear the author delivering his piece to camera as one reads it. That Marr's engaging style conceals an awful lot of information packed into quite a short book is something one might expect from a journalist who would shortly become BBC political editor. That it also conceals some pretty radical conclusions might come as more of a surprise. Marr presents himself as an expatriate Scot from a background steeped in traditional Britishness, and a comfortable citizen of the UK. Nevertheless, he detects in Scotland a widespread conviction that the country is firmly set on the path to independence. In England, he finds a mood reminiscent of the early stirrings of Scottish nationalism. There is a particularly interesting encounter with Cyning Meadowcroft, an English nationalist who changed his first name from the French Rex to its Anglo-Saxon equivalent. This might seem eccentic, but as Marr points out, it is an exact parallel to the way Celtic cultural nationalists have behaved over the years. In capturing such grassroots developments, Marr demonstrates that he is much more than a Westminster village reporter. Inevitably, some aspects of the book have dated somewhat. The showdown over the euro that Marr anticipates has not come to pass. Instead, 9/11 paved the way for a resurgence of the kind of top-down Britishness that he warns against here. Nevertheless, the evidence for his central conclusion, that an English parliament in a federal Britain is now the only alternative to the complete break-up of the UK, has only grown stronger with time.